The last few days the weather has been amazing in London. We’ve spent as much time outside as possible, and while working from a bench in the park isn’t the most ergonomically correct option, it’s definitely boosted my energy levels. As it feels like summer as arrived (pretending I haven’t seen the rainy forecast for next week) I’ve started to look for inspiration for my summer wardrobe. For some reason, I always seem to be surprised when summer rolls around and I realise I actually need to wear something other than (black) pants and a tee. Granted, in Denmark the weather is tricky and not always as summery as I would like, however, it does happen and so does holidays to warmer places. So, I’ve been looking to add some summery pieces to my wardrobe and I thought I’d share my inspiration with you. 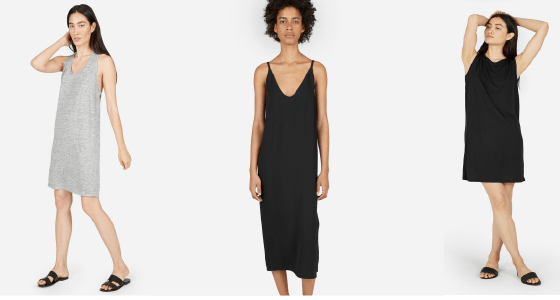 These dresses might not scream summer, but going through my Pinterest board I realised how much I prefer a loose fit, neutral colours and clean cuts. This also makes it possible for me to wear the dress year-round with stockings and knits in fall and winter, sneaks and a lightweight jacket in spring and sandals and over a bikini and with sandals in summer. When looking around for the worldwide web at some of my favourite eco-friendly brands, I make sure to only go for something that matches my mood-board. This way I know I’ll actually love the dresses and it won’t just be a spur of the moment decision – haven’t we all had that dress that looked amazing on a beach in Thailand, but just doesn’t work back home in real life?! Previous Article← Copenhagen Fashion Summit : Does it really help push the change?